Last time we discussed about the temple of Ghantiali Mata. We now move further. Another 10 Kms from the temple of Ghantiali Mata, is a major tourist attraction, the temple of Mata Tanot Rai. Tanot is a small town which is about 120 Kms from Jaisalmer and is very close to the Indo-Pak Border. The myths associated with the goddess are many, but we will start at the very beginning. 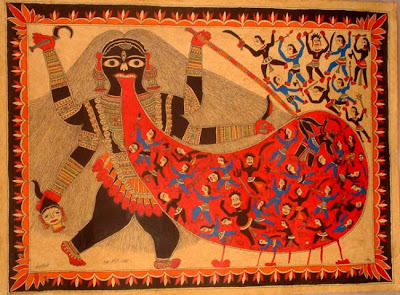 The original and one of the first ones is associated with the self-immolation of Sati on the insult of her husband Shiva. It is said that Shiva had suggested that Sati not visit her father for a Yagna he had hosted and not invited both Sati and Shiva. But Sati did go and on feeling insulted, had thrown herself in the fire of the Yagna. When Shiva came to know about it, he was very upset with the ganas (Charans) he had sent along with Sati for not being able to protect his wife. In his anger he cursed them that they would not go back to heavens with him, and thus deprived them of immortality and the status. The Charans pleaded but Shiva would not hear of it. The Charans then fell on the feet of the dead Sati and started lamenting. A voice came from the dead body of Sati which said that the curse of Lord Shiva had to be borne; however, since it was she who was responsible for their condition, she said that whenever she would be born as a human, she would take birth in the Charan community only. It is said that due to the blessings of Sati, there were numerous births of Sati in the Charan community and there are many minor myths and miracles credited to the goddess. Thereafter the Charans were also referred to as ‘devi-putra’, sons of the goddess. Later, Shiva took the dead body of Sati and went berserk in his pain and sorrow. Lord Vishnu had no option but to send his sudarshan-chakra, the discus, to sever the body into different pieces. As is well known that a religious site came up in all the places where a part of the body fell. In this region fell Sati’s head, and the place is known as Hinglaj. After Partition, this place now falls in the Balochistan province of Pakistan and the Charan community has converted to Muslim in due course of time. The present temple premises of Tanot Rai Mata is considered to be an extension of the main Shakti-peeth at Hinglaj. The region is full of small myths associated with different births of Tanot Mata and numerous miracles are associated with the goddess, which is quite a norm associated with any divinity. However, the goddess Tanot Mata has modern day miracles associated with her too. It is said that during the 1965 Indo-Pak war, the Pakistani troops were very close to the temple premises. The Pakistani forces had fired more than 3000 bombs and nearly 450 of them were targeted at the temple. But it was nothing short of a miracle that none of them exploded! Some of the shells have been kept in the temple premises as done in museums (see picture). The temple is close to Longewala, the Indo-Pak border and after the war, the temple was handed over to the Border Security Force (BSF) which till date manages the temple. The BSF has erected a memorial in the temple premises. The temple has become better known to people outside Rajasthan after it was shown in the Hindi movie “Border”. Though the locals have their faith and belief in the goddess, the name and fame of the temple and the goddess is thanks to its historical association. No matter what science tells us and teaches us, our emotions are kindled when we hear about the Pak firing and the unexploded shells. It’s more of a tourist attraction than a place of religious sanctity. Also, the myths associated with Hinglaj are a mere association as this is not a Shakti-peeth, but the texts and books available there have mentioned the temple’s ‘association’ with the famous Shakti-peeth which now falls in Pakistan. The last two temples (i.e. Ghantiali Mata and Tanot Mata) are religious places but have historical association. This is found across the country and many places where some aspect of the divinity shakes hand with history – creating an air of reality which is both believable and assignable to a current date. Is this done out of a purpose or just gets associated due to an accidental occurrence, is tough to prove. But the fact that the association lends credence to the sanctity cannot be undermined. Even in Greek Mythology, scholars trace the Trojan War to history, but at the same time it has numerous references of gods and goddesses participating in the war. Finally is it history adding to the truthfulness of mythology or is it mythology lending a religious credence to historical events, is a matter of debate. Next we will go through one more example of mythology during historical times, but with a difference. The myths do not incite communal tensions, rather promotes communal harmony. Keep reading. During a recent visit to Rajasthan, we came across a few temples which seemed to be well-known locally and besides its religious relevance it seemed to have some historic relevance too. The idea of mythology and history shaking hands got me interested and we decided to visit the temples. Today we will discuss the first temple and its historic relevance. About a 100 kms from Jaisalmer, Rajasthan, is a temple known as the temple of Ghantiali Mata. Amidst white sand and what seemed to a picture-perfect setting was a small temple, which was thronged by locals and a few tourists who stopped there before proceeding further. The temple premises were quite simple and there wasn’t the usual chaos and commotion that goes with many a temple in India. However, we were told that the temple witnesses such crowds during the bi-annual Navratri (the nine-day festival dedicated to goddess Durga). On reaching the temple, I spoke to the local priest, trying to understand the myths associated with the temple. The priest was more than happy to tell me a brief story. At this place, in the midst of a desert, was a menacing demon, Ghantial, who was harassing the locals. Goddess, Durga, fought a battle and killed the demon at this place and since then, there has been a temple in her honour and is since then referred to as Ghantiali Mata – the goddess who killed the demon Ghantial. On the walls of the temple, was another story, which too is quite interesting, but seeped in communal overtones and needless to mention was written in a provocative red colour. Briefly, this is what was written. Once the Muslims (mentioned exactly in the same way), killed all the members of a family. The only survivor of the family was a pregnant daughter-in-law who had been to visit her parents and thus was spared. When she came to know that all members of her family were killed, she was grief-stricken and left the village and settled elsewhere and soon delivered a boy. The boy grew up and started going to school and one day came back crying as all her friends were teasing him for not knowing his father’s name. On insisting, the mother broke down and related the story of how his family members were killed before he was born. When the boy grew up to be a man, he one day left his home with a sword to avenge the death of his family members. On reaching the spot where the temple stands today, he felt tired and sat to take some rest. (In those days there was a very small temple in the same spot, dedicated to some goddess, details of which are not mentioned). Soon from nowhere a small girl appeared in front of the man and offered him some water, and after drinking the same, he suddenly felt very energetic. Then the girl said that to the man, that he will achieve his objective soon. The man wanted to know as to how she knew what he was seeking; the little girl said that she knew everything about the whole world. The man knew that this was no ordinary girl and fell at her feet and sought directions to achieve his objective. The girl then told him where to go, but put a condition that he should not kill too many people. If he trusted her, then he should kill only one person from the community and the rest would die on their own. On hearing this, the man promised that if this happened then he would return there and offer his head to her. The girl went on to say, that mothers do not like to see the severed heads of their sons, but he should return here once his mission is accomplished. The man goes to the village he was advised and there he saw a Muslim marriage procession which was going somewhere. He went close to the end of the procession and killed one person and stood on the side. Soon people saw one dead man amongst them and started to blame each other and there was a fight amongst them and soon all were dead – just as mentioned by the girl. The man was happy and came back to the spot where he had met the girl, but didn’t find her. He started calling out for her by calling “Mother, mother”, but the girl was nowhere in sight. Disappointed, he took out his sword and tried to sever his head and then he heard a voice coming from the small temple which said “Stop”. The man saw no one there and tried to kill himself again and he heard the same voice and this went on for three times, till the goddess came forward and held his hand and said – “If you kill yourself, then who will worship me?” and it is said that the man built this temple in the present form. Every religious sight has a miracle or some story of origin to lend it its relevance or moment of glory. Be it the ‘Shakti-peeths’ or a road-side temple or a religious spot and this one is no different. It is this little divinity which brings it the halo-effect and lends the much needed religious credence. But in this case, the credibility of this temple has some recent occurrences which overshadow the myths mentioned above. The Pakistan border is about 45-50 Kms from this spot. According to the locals and some writings on the walls of the temple premises, during the 1965 war with Pakistan, the Pakistani forces had come close to the temple premises. It is during this time that there were certain miracles that took place. The Pakistani forces tried to destroy the temple and it is said that the forces suddenly started firing at themselves, thus killing all of them. Then some forces who had reached the premises started breaking the idols. When they were stopped by the locals, they did not agree, and continued breaking the idols, but soon the forces started fighting amongst themselves and ended up killing each other. The third time, some of the forces tried to remove the ornaments and the finery of the goddess and each one of them turned blind. At the end of it all, the temple was not destroyed, except for the original idols, which are kept in the premises as a mute witness to history. Today, the temple has its religious status in the nearby areas, but seems to attract crowd more for the historic appendage which seems to be of more interest to one and all, especially in the much-polarised communal state and the relationship we share with Pakistan. Next we will discuss another temple which was close by and its association with history, which is not very old and forgotten. More pictures are available for those interested.